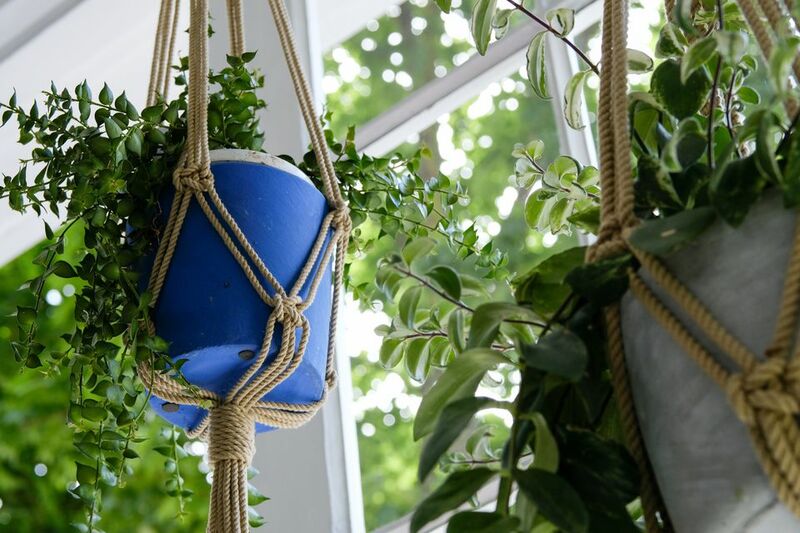 Macrame is a retro craft that has been enjoying a comeback lately thanks to the popularity of boho chic decor and is one of the trendier ways to adorn your house this fall. Woven wall hangings are a fresh alternative to tired trends like pallet art; but, if you've never tried macrame before, some of these intricate designs are intimidating projects to try right out of the gates. If you're a beginner, try making a simple macrame plant or candle holder first to "learn the ropes." Here are the few inexpensive materials you need for this project. After you've gathered your simple supplies, get a rough idea of how long you want your holder to be (i.e. how far down you want it to hang from the ceiling or a hook). Add about twelve inches to this, just to be sure it won't end up too short, then cut 8 equal lengths of string or cord to this measurement. Align one end of all 8 pieces, and tie a knot to that end (as shown). This will be the bottom tassel on your holder. Tip: While you have the measuring tape out, measure the height of the pot or candle holder you wish to suspend in the macrame holder. Subtract 1, then divide this number by 2. This number is a rough estimate of how far apart your knots should be spaced when you get to that step. Next, divide the 8 pieces of string into 4 groups of 2 and spread them out (as shown). Tie each set together about an inch up from your knot. It will look a little like a flower at this point. Next, pick up the left string from one set of strings and tie it to the right string from the set right next to it. (Remember that measurement you got at the beginning by subtracting 1 from the height of the pot and dividing by 2? This is roughly how far apart this row of knots should be from your first row of knots.) Repeat this step for the remaining 3 sets of strings. Repeat the same process as described in Step 4 for the third row of knots. When it's spread out, you should notice a flower shape within a square shape. After your knots are tied, place your pot or candle holder so that the tassel is centered on the bottom of it. Bring up all four sets of string and adjust the pot as necessary so that the strings are fairly evenly spaced around it and it hangs straight. Tie a ring onto the ends of a string as tightly as you can. Trim the excess string to the length you desire. Use a bracket or an eye hook in the ceiling to hang and enjoy your new macrame holder. Fill it with fresh flowers or plants such as succulents or air plants, or a candle.